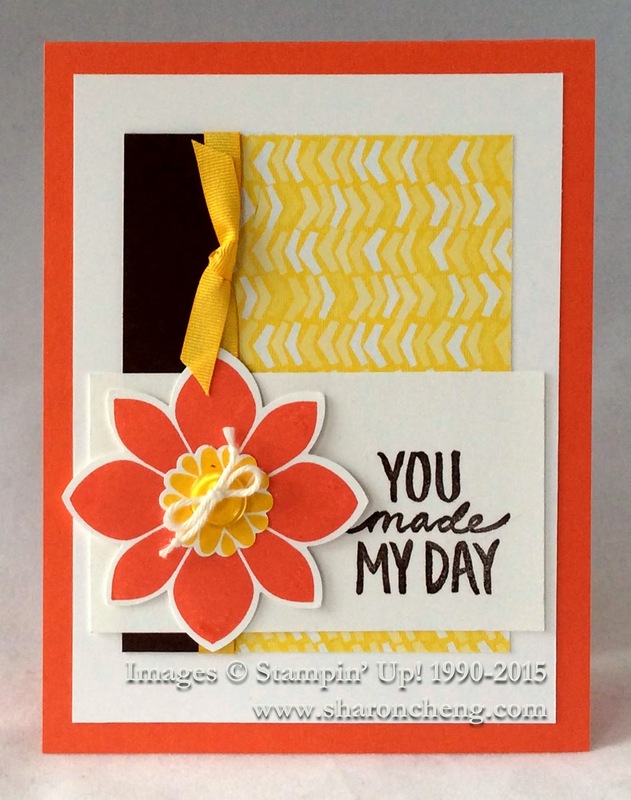 One of my favorite bundles in Stampin' Up! 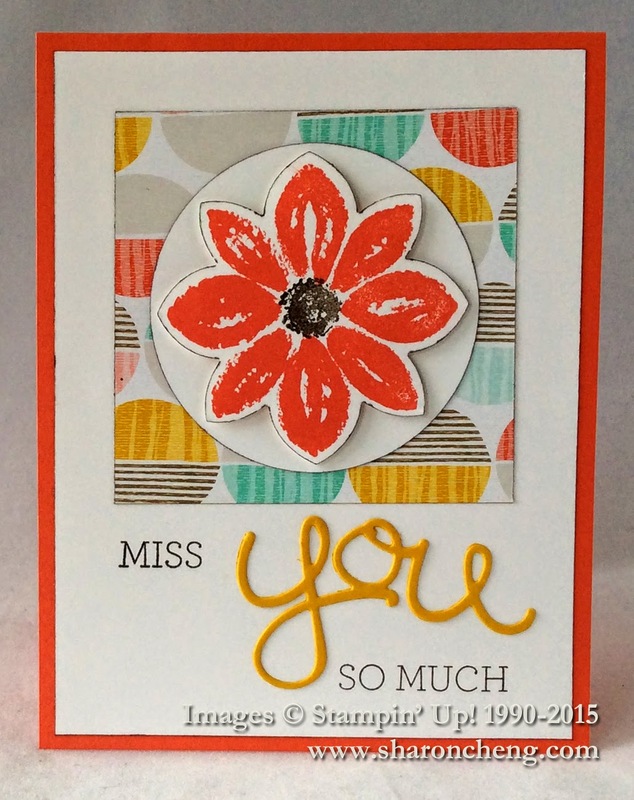 's Occasions catalog combines Stampin' Up! 's Petal Potpourri stamp set and Flower Medallion Punch for a 15% savings. I like this combination because you can use it to make many different paper crafting projects. 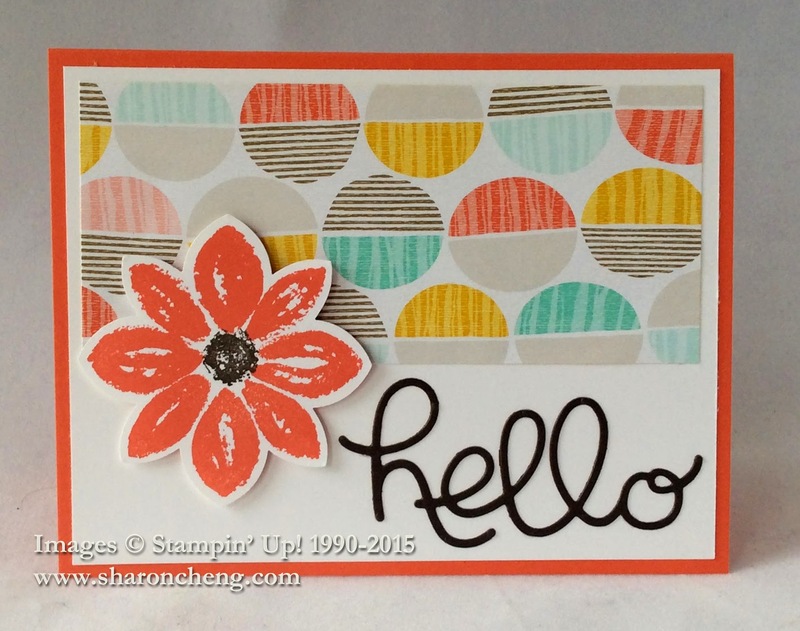 When I saw the Splitcoaststampers Clean and Simple challenge to "Use Your Words", it was the perfect time to combine Petal Potpourri and the Hello You Thinlits to make some quick and easy cards. This first card was actually a mistake that I liked so much that I plan to do it again. Originally, I meant to cut the Best Year Ever designer series paper the same width as the Whisper White card stock. Well, I didn't measure correctly and ended up having to leave a thin mat. When you do something accidentally that you like, one of my teachers called it serendipity. This was definitely a case of serendipity! After making the first card, I had this leftover square of Best Year Ever designer series paper. It was much too big a scrap to throw away! So instead, I was inspired to make this card using the Stampin' Supplies. I added some words from the Crazy About You stamp set. This will be a great Operation Write Home card! Notice the thin edge on the flower and Whisper White circle? You can see the edging technique I used in this video tutorial using an Early Espresso Stampin' Marker. The Hello You Thinlits are easy to cut out using this dryer sheet tutorial. This was actually my "warm up" card. When I'm needing some inspiration, I find that CASEing a card can get my creativity going again. By the time I get out the supplies needed to CASE (Copy And Share Everything) for a project, I find that I'm having to substitute something or fix a mistake. The next thing I know, I've done a poor job of CASEing and have something more "original". Some days I keep CASEing hoping that inspiration will come. Even if it doesn't, I still have some great projects. What do you do when you have a creative block? These 3 cards use the following colors: Calypso Coral, Crushed Curry, Early Espresso and Whisper White. Stampin' Supplies with the price listed as SAB are Sale-A-Bration items that are free with a $50 purchase. When you buy the Crazy About You and Hello You Bundle, you get to choose a free Sale-A-Bration item. Visit my online store to get what you want for your next project. Remember that when you purchase $25 or more in product, you are eligible for my Rewards Program. When you buy $50 in product, you'll get to choose a free Sale-A-Bration product and two credits in my Rewards program. It's so easy to get free product during Sale-A-Bration.